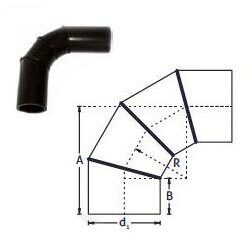 Owing to our rich industrial experience, we have emerged as a reputed Manufacturer and Supplier of PE Buttweld Fabricated Segment Bend (90 Degree). The PE Buttweld Fabricated Segment Bends (90 Degree) offered are manufactured in adherence with international quality standards and norms. To ensure that only defect free Segment Bend (90 Degree) reaches the customers, strict tests based on parameters like dimension, durability, corrosion resistance, thermal resistance, etc before the final dispatch.